1. Anglican (Church of England) parish churches. To contact an Anglican parish church in Suffolk, visit the Church of England's address site A Church Near You. of call will probably be whoever has the e-mail address. To contact a Catholic parish church in Suffolk, open the East Anglian Diocesan Directory. This is a complete directory to all Catholic parishes in East Anglia - just scroll down to the one you want. For best results, contact the Parish Priest. To contact the parish of a redundant Anglican church in Suffolk, follow instructions for Anglican churches above. parish names retained as part of the new parish name. If you want to contact the people running the church now, a good place to start is the Churches Conservation Trust. The best advice is to put the church name in a search engine. 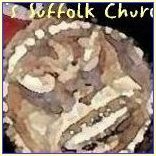 Some non-parish Suffolk churches, especially Baptist ones, have extensive websites.